This commode is stamped A.G. on the base. Another formerly in the Chalondon Collection, of exactly this form, also stamped A.G. and with almost identical decoration but in première-partie marquetry, was sold Tajan, Paris, 25 June 1996, lot 183. The stamp A.G. is associated with the ébéniste Aubertin Gaudron, working in the rue Saint-Honoré, who supplied the Garde-Meuble Royal between 1686 and 1713. Another very similar commode, not stamped but obviously by the same maker was sold Christie's London, 22 June 1989, lot 119. The top of the commode was centered by an oval cartouche decorated with the French Royal interlaced L monogram on a blue-stained horn ground. 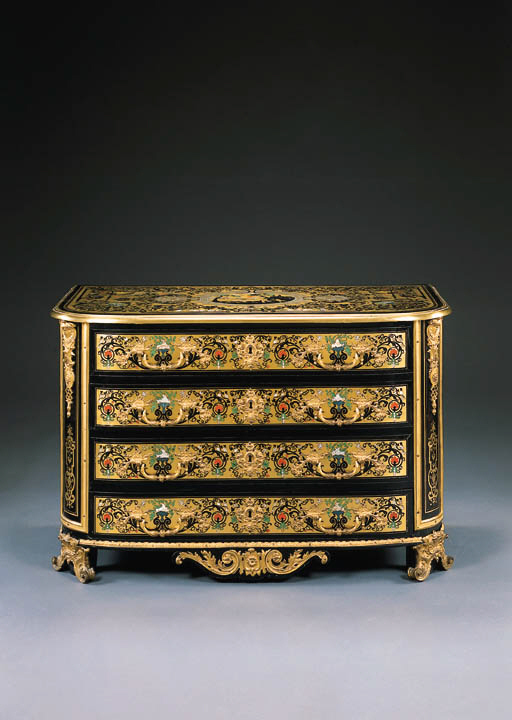 This commode, although not yet traced in the Garde-Meuble inventory, proves the link between Aubertin Gaudron and the Garde-Meuble Royal .